Salvage the wreckage with this protein packed moisturiser! 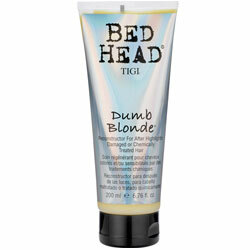 Protect your highlights or colour and leave your hair shiny, soft and in perfect condition. Aqua, (Water), Behentrimonium Methosulfate, Ceteraryl Alcohol, Stearyl Alcohol, Parfum (Fragrance), Trimethylsiloxyamodimethicone, Hydrolyzed Wheat Protein, Dimethicone, Polysorbate 60, Cetyl Alcohol, Glycerin, Panathenol, Sodium PCA, Ketatin Amino Acids, Glycine Soja (Soybean) Protein, Methyparaben, Propylparaben, Methylisothiazolinone, Metylchlorisothiazolineone, CI 19140 (Yellow 5).